The knowledge about the benefits of better lighting has increased strongly in recent years. Below are some facts about what better lighting can do for you in your private and professional environment. Digitalisation means both LED technology that results in better lighting and digital components offering additional functionalities. Find out more about smart lighting solutions. Feel the rhythm: Research shows that light has a substantial impact on our mood, energy, alertness and ability to focus. This is because our body’s circadian rhythm, or internal clock, is triggered by morning light producing the hormones we need throughout the day. As a result, we often feel full of energy on a sunny day and more ready to sleep that night. How smart is your building? 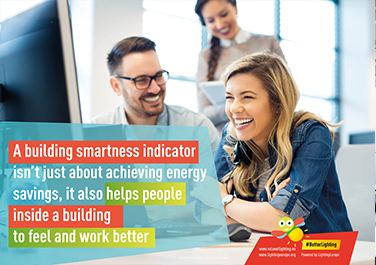 Said simply, a building smartness indicator is a certificate or label that shows to what extent a building has implemented smart solutions. This certificate can encompass everything from basic controls to data-enabled smart solutions and all the way up to fully-integrated systems that allow for individualised settings. 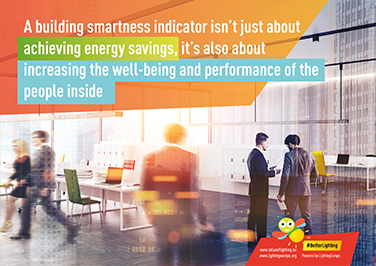 Energy efficiency and more: A building smartness indicator will support the reduction of energy consumption throughout a building’s lifetime.However, in addition to energy efficiency, a smartness indicator can also address building optimisation and the well-being and performance of its occupants. • Place data-generating sensors to optimise the use of a building’s space, resulting in lower utility bills and better uptake by users. 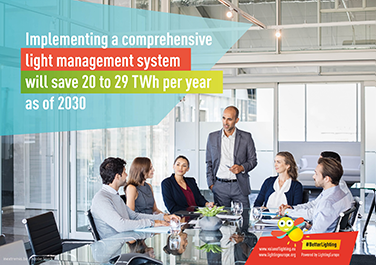 • Integrate the lighting management system with the building’s other technical systems to create a more productive working environment. • Have individualised flexibility across all building systems, which will enable occupants to help reduce the building’s environmental impact while also working to increase their own well-being. • Smart connected emergency lighting allows for on-line system monitoring – essential to maximising safety. 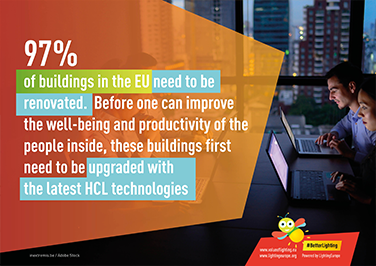 Healthy buildings are not only energy efficient but also improve the well-being of their occupants. Find out more about how lighting contributes to both. Big benefits: Properly using a building smartness indicator will result in the reduction of business operating costs, along with an increase in the value of the property and the general stock of the Healthy Buildings market. 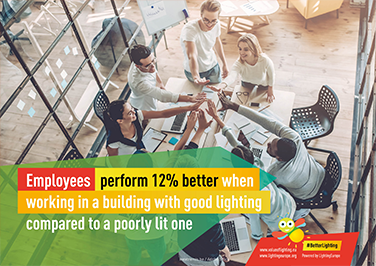 More than the bottom line: Renovating a building to include Human Centric Lighting will improve the comfort of the building’s interior, resulting in improved health, well-being and productivity of the occupants inside, increasing the building’s overall value. 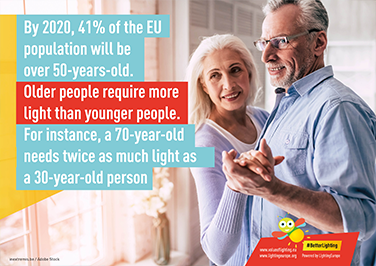 Lighting is key to age-friendly environments and improves the recovery of people in hospitals and quality of life in elderly homes. Learn more from the latest studies. 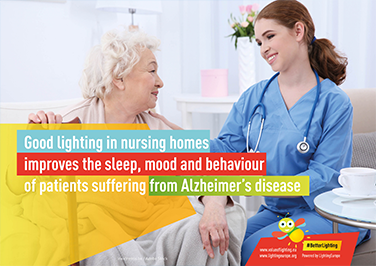 Positive Developments for Alzheimer’s patients: A new study by the Lighting Research Centre suggests that using lighting to mimic natural day-night patterns could improve sleep and mood for patients suffering from Alzheimer’s disease. Regulating light exposure: The study used lighting designed to stimulate a patient’s circadian rhythm, the system that regulates our sleep and wake cycles. Nursing home residents are often exposed to varying levels of electric light in the different areas of the residence and throughout the day and night. 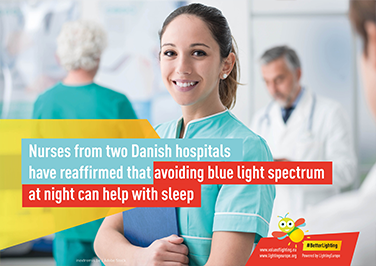 Their circadian rhythms can be easily disrupted if lighting is not correct, this will harm the capacity of the resident to be awake during the day and to sleep during the night. By the numbers: The study tested the lighting interventions on 43 nursing home residents for four weeks and another 37 residents for six months. Depending upon where the patient spent most of their time, the tailored lighting included either a custom-designed LED table light or individual room lighting. Personal light meters monitored each patient’s level of exposure. Reducing disturbances and depression: Researchers saw a significant decrease in sleep disturbances, depression and agitation – all leading effects of institutionalisation. Specifically, after four weeks, reported levels of sleep disturbances and depression had declined significantly. By the end of six months, sleep disturbances were cut in half, and depression scores were less than half of baseline levels. Lighting is key to age-friendly environments. By adjusting the lighting in the office and the home to individuals’ needs, we create comfortable environments for all ages that can evolve and adjust to each person’s needs. 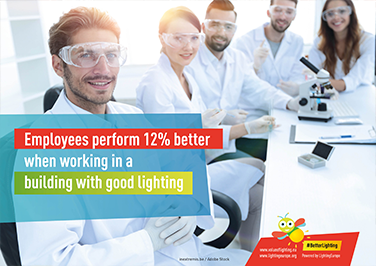 The macro-economic benefit of better lighting is becoming more evident in recent studies. Find out more about the benefits of better lighting in the professional environment. 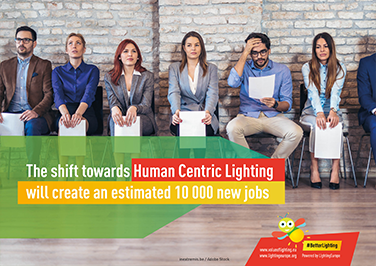 Human Centric Lighting = new jobs: Human Centric Lighting (HCL) is a step-change in lighting solutions. As such, it requires new skills. In addition to engineers, physicists and designers. HCL also requires health consultants, integration engineers and psychologists – amongst others. In other words, HCL means job creation. Human Centric Lighting is good for the economy: It is estimated that by 2020, the HCL market will be worth EUR 1.4 billion. 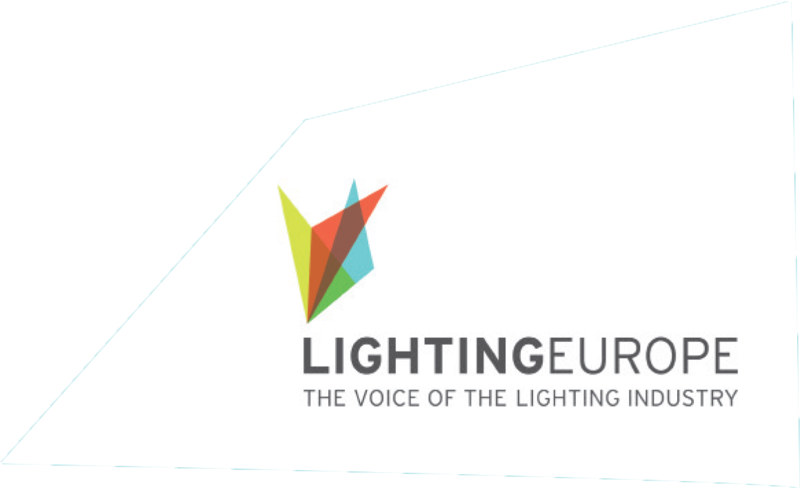 This represents 7% of the European lighting market and between 20-25% of its high-end segment. It will also result in the creation of direct, indirect and induced jobs. With an employment multiplier of 2.91, every new HCL job will result in the creation of 2.91 jobs – for an estimate of 10 000 new jobs for Europeans. This is aside from the multiple benefits it will create for people and business in its application. 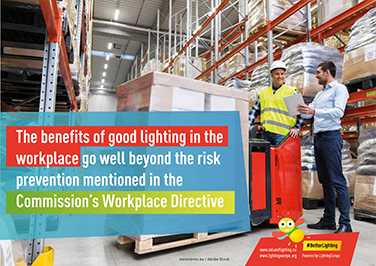 Better lighting in the workplace helps people feel and work better. Below are some facts about what better lighting can do for you in your professional environment. Good for the mind, body and soul: Good lighting supports good all-around health. 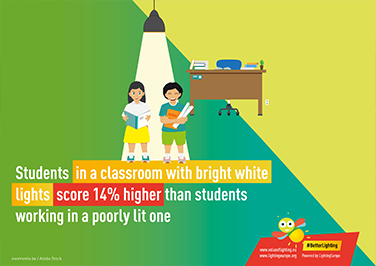 Light affects our vision, safety and orientation. It also affects the body, influencing our alertness, cognitive performance and sleep/wake cycle. Light even affects our emotions, changing our moods, giving us energy and helping us relax. Your brain and light: The brain regulates our body’s circadian rhythm based on cues it gets from light. Our reaction depends on; the time of day, the intensity, direction, the colour of the light, and the amount perceived – all of which impact the synchronisation of our body clock with the daylight helping us to be fully awake during the day and sleep deeply at night affecting our capacities, mood and overall wellbeing. It is important to receive the right light for our activities at the right place at the right time. Children have a different circadian rhythm compared to adults. 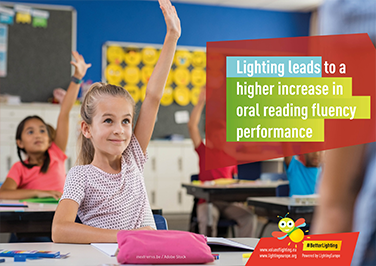 Learn about the specific benefits of better lighting in schools. Welcome to Malmö: To keep up with its fast-growing population, Malmö must build 35 new schools in the coming years. But these won’t be just any schools. Knowing that top-notch education is crucial to the city’s success, Malmö intends to build the state-of-the-art schools its multicultural population deserves. A bright idea: Seeing that the old lighting used in existing schools was inefficient, Malmö decided to include Human Centric Lighting into the design of the new schools. To make the classrooms more attractive and more conducive to learning, the new system allows users to change both the illumination level and colour temperature (warm or cool) of the lights, adapting it to the activities and to the moment of the day. The details: The system uses recessed 600 mm x 600 mm panels fitted with LEDs. The 40W panels can change intensity and colour temperature (from 2,700K to 6,500K) either automatically or manually. Kid approved: Not only has the Sweden Parents Association given the new lighting system the thumbs up, the students have too. They note that the new lights help them stay focused and awake.